Haliscomenobacter hydrossis van Veen et al. 1973 is the type species of the genus Haliscomenobacter, which belongs to order “Sphingobacteriales”. The species is of interest because of its isolated phylogenetic location in the tree of life, especially the so far genomically uncharted part of it, and because the organism grows in a thin, hardly visible hyaline sheath. Members of the species were isolated from fresh water of lakes and from ditch water. 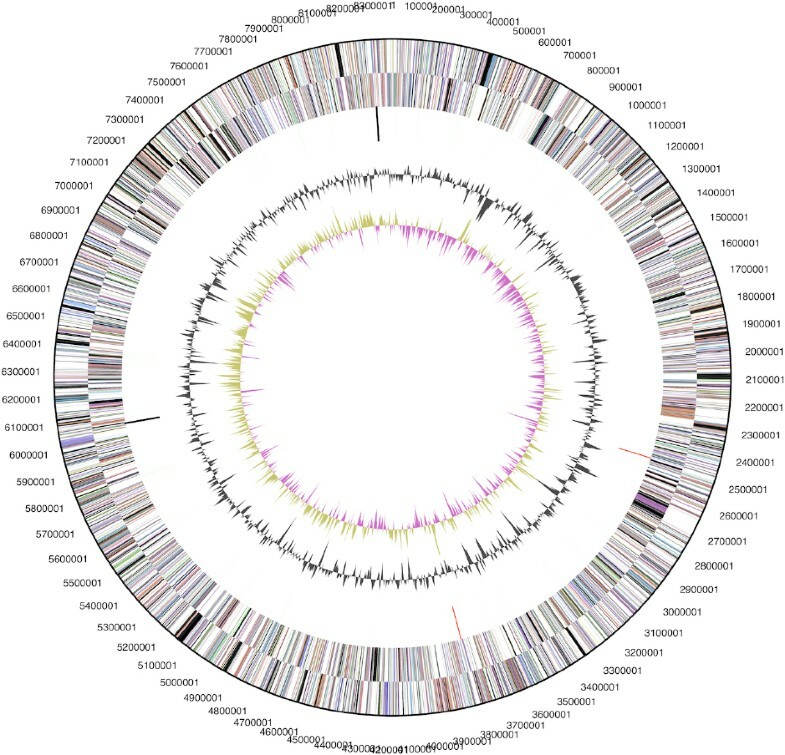 The genome of H. hydrossis is the first completed genome sequence reported from a member of the family “Saprospiraceae”. The 8,771,651 bp long genome with its three plasmids of 92 kbp, 144 kbp and 164 kbp length contains 6,848 protein-coding and 60 RNA genes, and is a part of the Genomic Encyclopedia of Bacteria and Archaea project. Strain OT (= DSM 1100 = ATCC 27775) is the type strain of Haliscomenobacter hydrossis which is the type and only species within the genus Haliscomenobacter [1,2]. The generic name derives from the Greek word haliskomai, to be imprisoned, and the Neo-Latin bacter, a rod, meaning the imprisoned rod. The species epithet is derived from the Greek word hudôr, water, and Oss, a town in the Netherlands, hydrossis, from water of Oss. The imprisoned rod from the water of Oss. Five morphologically and physiologically congruent strains belonging to the species, including the type strain OT, were isolated from activated sludge samples in the early 1970s . H. hydrossis was sporadically observed in aeration tanks of sewage treatment plants in Germany  and in paper industry wastewater treatment plants in France . As a recent biotechnological application, biomass bulking caused by H. hydrossis was controlled by lytic bacteriophages . An improved high quality draft sequence of Saprospira grandis strain Sa g1 (=HR1, DSM 2844, GOLD ID Gi033955) is the only other genomic information currently available from the family “Saprospiraceae”. Here we present a summary classification and a set of features for H. hydrossis OT, together with the description of the complete genomic sequencing and annotation. The single genomic 16S rRNA sequence of H. hydrossis OT was compared using NCBI BLAST  under default settings (e.g., considering only the high-scoring segment pairs (HSPs) from the best 250 hits) with the most recent release of the Greengenes database  and the relative frequencies of taxa and keywords (reduced to their stem ) were determined, weighted by BLAST scores. The most frequently occurring genera were Haliscomenobacter (83.9%) and Lewinella (16.1%) (3 hits in total). Regarding the two hits to sequences from members of the species, the average identity within HSPs was 99.2%, whereas the average coverage by HSPs was 98.1%. Among all other species, the one yielding the highest score was Lewinella antarctica (EF554367), which corresponded to an identity of 89.1% and an HSP coverage of 66.6%. (Note that the Greengenes database uses the INSDC (= EMBL/NCBI/DDBJ) annotation, which is not an authoritative source for nomenclature or classification.) The highest-scoring environmental sequence was AJ786323 (‘Lake Wolfgangsee freshwater enrichment clone MS-Wolf2-H’), which showed an identity of 98.8% and an HSP coverage of 97.9%. The most frequently occurring keywords within the labels of environmental samples which yielded hits were ‘lake’ (10.6%), ‘tin’ (5.3%), ‘microbi’ (3.4%), ‘freshwat’ (3.2%) and ‘mat’ (3.2%) (247 hits in total). The most frequently occurring keywords within the labels of environmental samples which yielded hits of a higher score than the highest scoring species were ‘lake’ (11.1%), ‘tin’ (5.6%), ‘microbi’ (3.5%), ‘freshwat’ (3.4%) and ‘mat’ (3.3%) (225 hits in total). These keywords reflect the ecological properties reported for strain OT in the original description . Figure 1 shows the phylogenetic neighborhood of H. hydrossis in a 16S rRNA based tree. The sequences of the two 16S rRNA gene copies in the genome differ from each other by two nucleotides and do not differ from the previously published 16S rRNA sequence AJ784892, which contains two ambiguous base calls. 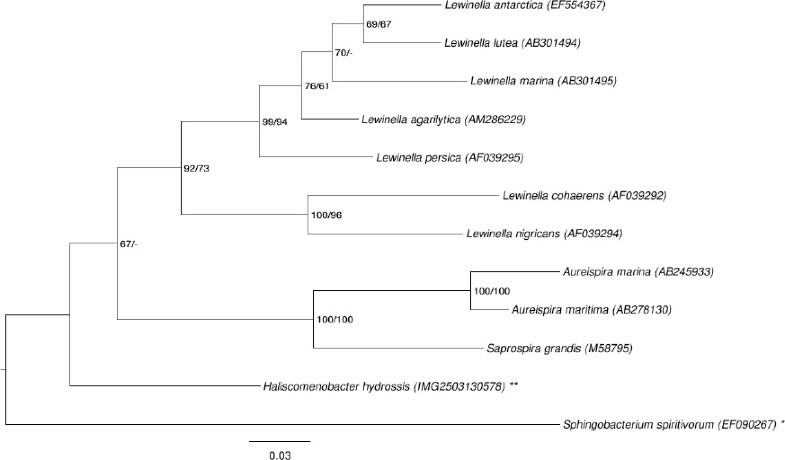 Phylogenetic tree highlighting the position of H. hydrossis relative to the type strains of the other species within the family “Saprospiraceae”. The tree was inferred from 1,399 aligned characters [9,10] of the 16S rRNA gene sequence under the maximum likelihood (ML) criterion . Rooting was done initially using the midpoint method  and then checked for its agreement with the current classification (Table 1). The branches are scaled in terms of the expected number of substitutions per site. Numbers adjacent to the branches are support values from 150 maximum likelihood bootstrap replicates  (left) and from 1,000 maximum parsimony bootstrap replicates  (right) if larger than 60%. Lineages with type strain genome sequencing projects registered in GOLD  are labeled with one asterisk, those also listed as ‘Complete and Published’ with two asterisks. The cells of H. hydrossis are rod-shaped, 0.35–0.45 µm wide and 3–5 µl long, mostly occurring in chains and nearly always enclosed by a narrow hyaline sheath (Figure 2) . The sheath is sometimes disrupted by branching cells . Flagella were never visible in EM images nor was motility ever observed . Growing bacteria excrete so far unidentified polysaccharides . Strain OT grows strictly aerobically and produces intracellular carotenoid pigments . Optimal growth temperature was 26°C, with a span of 8–30°C . Optimal pH for growth was 7.5 . Organic acids, peptides, proteins, mono- and polysaccharides were reported as carbon and energy sources . Starch and gelatine were decomposed by all strains of the species , sorbitol, glycerol, lactate, acetate, succinate and β-hydroxybutyrate were not utilized . The authors of the original description of the strain suggested that OT accumulates polysaccharides either intra- or extracellularily . 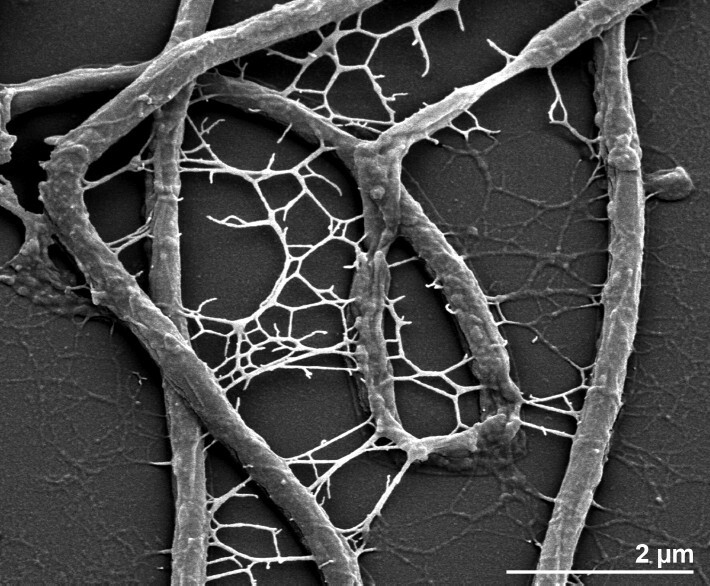 Nothing is known about the structure of the cell wall of H. hydrossis. The six major fatty acids of strain OT were iso-C15:0 3-OH (22.8%), iso-C15:0 (21.0%), C16:1 (17.3%), iso-C15:0 2-OH (15.5%), and C18:0 (6.9%) and C16:0 (5.7%) . The type strain contained significantly more hydroxylated fatty acids than several analyzed reference strains from the genus . Observed quinones were mainly of the MK-7 type (70-90%), with 10–30% MK-6 . Classification and general features of H. hydrossis OT according to the MIGS recommendations  and the NamesforLife database . H. hydrossis OT, DSM 1100, was grown in DSMZ medium 134 (Haliscomenobacter Medium)  at 26°C. DNA was isolated from 0.5–1 g of cell paste using MasterPure Gram-positive DNA purification kit (Epicentre MGP04100) following the standard protocol as recommended by the manufacturer, with modification st/DL for cell lysis as described in Wu et al. . DNA is available through the DNA Bank Network . The genome was sequenced using a combination of Illumina and 454 sequencing platforms. All general aspects of library construction and sequencing can be found at the JGI website . Pyrosequencing reads were assembled using the Newbler assembler (Roche). The initial Newbler assembly consisting of 153 contigs in three scaffolds was converted into a phrap  assembly by making fake reads from the consensus, to collect the read pairs in the 454 paired end library. Illumina GAii sequencing data (1,273.3 Mb) was assembled with Velvet  and the consensus sequences were shredded into 1.5 kb overlapped fake reads and assembled together with the 454 data. The 454 draft assembly was based on 369.3 Mb 454 draft data and all of the 454 paired end data. Newbler parameters are -consed -a 50 -l 350 -g -m -ml 20. The Phred/Phrap/Consed software package  was used for sequence assembly and quality assessment in the subsequent finishing process. After the shotgun stage, reads were assembled with parallel phrap (High Performance Software, LLC). Possible mis-assemblies were corrected with gapResolution , Dupfinisher , or sequencing cloned bridging PCR fragments with subcloning. Gaps between contigs were closed by editing in Consed, by PCR and by Bubble PCR primer walks (J.-F. Chang, unpublished). A total of 589 additional reactions were necessary to close gaps and to raise the quality of the finished sequence. Illumina reads were also used to correct potential base errors and increase consensus quality using a software Polisher developed at JGI . The error rate of the completed genome sequence is less than 1 in 100,000. Together, the combination of the Illumina and 454 sequencing platforms provided 203.8 × coverage of the genome. The final assembly contained 1,005,536 pyrosequence and 35,370,321 Illumina reads. The genome consists of an 8,371,686 bp long circular chromosome and three plasmids of 164,019 bp, 143,757 bp and 92,189 bp length, respectively, with a G+C content of 47.1% (Table 3 and Figure 3). Of the 6,918 genes predicted, 6,858 were protein-coding genes, and 60 RNAs; 106 pseudogenes were also identified. The majority of the protein-coding genes (58.6%) were assigned with a putative function while the remaining ones were annotated as hypothetical proteins. The distribution of genes into COGs functional categories is presented in Table 4. Graphical circular map of the chromosome (plasmid maps not shown). From outside to the center: Genes on forward strand (color by COG categories), Genes on reverse strand (color by COG categories), RNA genes (tRNAs green, rRNAs red, other RNAs black), GC content, GC skew. We would like to gratefully acknowledge the help of Anja Frühling (DSMZ) for growing H. hydrossis cultures. This work was performed under the auspices of the US Department of Energy Office of Science, Biological and Environmental Research Program, and by the University of California, Lawrence Berkeley National Laboratory under contract No. DE-AC02-05CH11231, Lawrence Livermore National Laboratory under Contract No. DE-AC52-07NA27344, and Los Alamos National Laboratory under contract No. DE-AC02-06NA25396, UT-Battelle and Oak Ridge National Laboratory under contract DE-AC05-00OR22725, as well as German Research Foundation (DFG) INST 599/1-1.